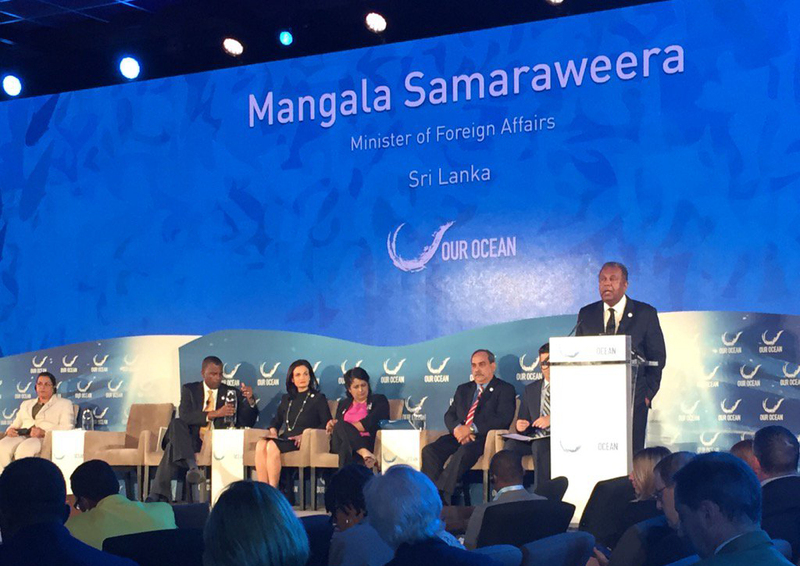 Participating at the Our Ocean Conference 2016, at the invitation of the US Secretary of State John Kerry, Foreign Minister Mangala Samaraweera, on 15 September, outlined several commitments by Sri Lanka to protect oceans around Sri Lanka and beyond. The Minister said that Sri Lanka is perhaps one of the few countries in the world where the Head of State himself holds the portfolio of Environment, given its vital importance for the country and to ensure that Sri Lanka plays its part in dealing with issues relating to climate change and environment in a responsible manner, both locally and in a global context. The Conference being held at the US State Department on 15-16 September is attended by representatives of approximately 100 countries including Heads of State and Government, Ministers, officials, academia, NGO community, leaders from the public and private sector and young people. This was the third in the series of Conferences on Our Ocean, held with the objective of calling the world’s attention to the challenge of protecting oceans and mobilizing countries to make commitments in this respect. The Conference which was inaugurated by the US Secretary of State was addressed by the US President Barack Obama as well. Foreign Minister Samaraweera joined a panel of speakers at the Conference, comprising the Presidents of Micronesia and Mauritius, Vice President of Panama, and Ministers of Foreign Affairs of The Bahamas and Madagascar on the theme ‘Global Ocean Leadership’, moderated by US Senator Brian Schatz from Hawaii. Outlining commitments made by Sri Lanka under the themes – Marine Protected Areas, Marine Pollution, Sustainable Fisheries, and Climate and Ocean, the Minister called for the discontinuation and banning of all fishing methods that harm marine eco-systems, worldwide, in particular, bottom trawling. I represent an island nation known as the ‘Pearl of the Indian Ocean’. -Located right in the middle of the Indian Ocean, half way between east and west; 1340 km of coastline; warm waters that are home to the world’s largest marine mammals – the unique Sri Lankan blue whales who are in fact ‘ecosystem engineers’ that help maintain the health and stability of our Oceans. Being an Island nation, we are acutely aware of how much our very life is dependent on the good health of the waters that surround us – the food that we eat; the air that we breathe; the weather; threat of temperature rising and ocean waters invading our land. It has been passed down to us from generation to generation, that if we don’t take care of the Ocean around us, and we allow our Ocean to become unhealthy and out of balance, that will lead to the eventual end of life as we know it, on the land that we occupy. After all, Oceans engendered life in the first place. Yet, no matter however much we become aware of the risks and the dangers, it is only in coming together like this, that meaningful action can be taken to address concerns as important as the health of our Oceans, and our Planet, that affect us all. I thank Secretary Kerry therefore, for his leadership in bringing countries across the world, together, to take action on caring for Our Oceans. Sri Lanka is perhaps one of the few countries in the world where the Head of State himself holds the portfolio of Environment, given its vital importance for our country, and to ensure that we play our part in a responsible manner on issues of Climate Change and Environment in a global context. Amongst the different ecosystems in Sri Lanka, mangroves represent a unique collection of specialized fauna and flora adapted to survive in brackish water conditions and in inter-tidal zones. We are in the process of drafting a National Policy for Conservation and the Sustainable Utilization of Mangrove Ecosystems. In July this year, to mark International Mangrove Day, President Maithripala Sirisena inaugurated the world’s first mangrove museum in Sri Lanka. The President has also given leadership in declaring a ‘National Coastal and Marine Resources Conservation Week’ to be observed in September every year. The first observance will take place from the 17th to the 23rd of this month. Sri Lanka has already declared 9 Marine Protected Areas in various parts of the country. In addition, four new areas providing habitats for marine mammals, coral, migratory and shore birds, and other marine life will also be declared as Marine Protected Areas, shortly. By the end of this year, we will complete the construction of a sea turtle conservation complex to treat and provide a sanctuary for injured turtles and educate and create awareness among the local communities. The Sea Mammals Regulations of Sri Lanka will be reviewed and amended. A third of our country’s population lives along the coastal belt. As such, new activities to protect these communities and assess the impact of sea-level rise and climate change will be introduced. We pledge to implement and improve the National Oil Spill Contingency Plan that will delineate responsibilities for the operational response to oil spills, and increase cooperation across sectors to coordinate and integrate their resources to respond effectively. Arrangements are presently underway to hold the ‘Sri Lanka NEXT – Blue Green Era conference’ in Colombo, with the goal of promoting sustainable development through blue-green economic initiatives. This conference will take place in parallel with the 5th Asia Pacific Climate Change Adaptation Forum next month. It is in our interest to secure and ensure sustainable fishing in the country. We will conduct a survey of fish resources and establish a robust fisheries information system by 2018; introduce environmentally friendly fishing gear; prohibit destructive fishing gear; and introduce an effective fisheries management system through vessel monitoring and enforcement of relevant laws. Sri Lanka is committed to combat IUU fishing. In recognition of the positive steps taken by Sri Lanka in addressing issues related to IUU fishing, the European Council, in June this year, lifted a ban imposed on the export of fisheries products from Sri Lanka. I want to take this opportunity to call for the discontinuation and banning of all fishing methods that harm marine eco-systems, worldwide, in particular, bottom trawling.